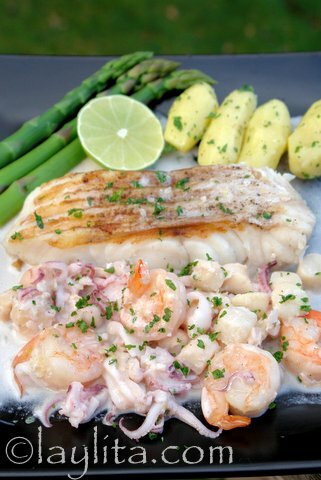 This recipe for grilled fish with seafood sauce is prepared with grilled cod topped with a creamy garlic seafood sauce made with shrimp, calamari, scallops, garlic, onion, white wine and cream. 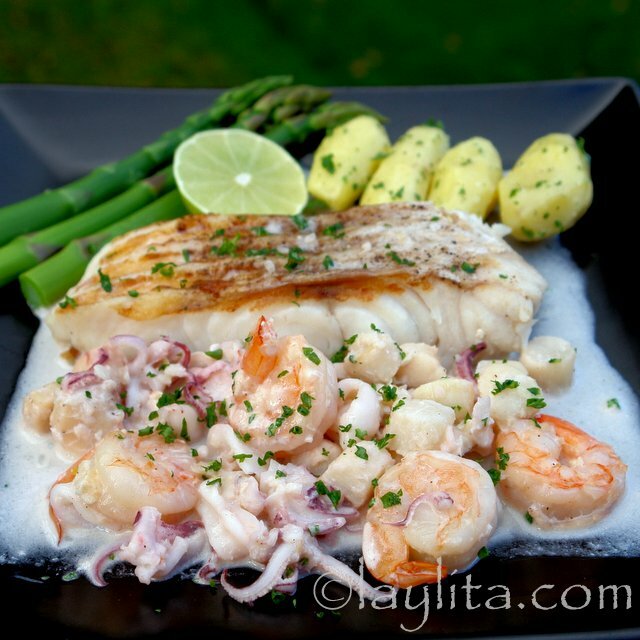 I had a delicious grilled fish in a seafood sauce a couple of years ago in Salinas, a beach town in Ecuador. Of course I had to try to make it as soon as I got home. The fish I had at the restaurant was robalo, which is called white snook in English, but it can be made with any fish, from halibut to snapper. This time I made it with cod and it was very good, though cod usually has a few bones so beware – especially for the kids. 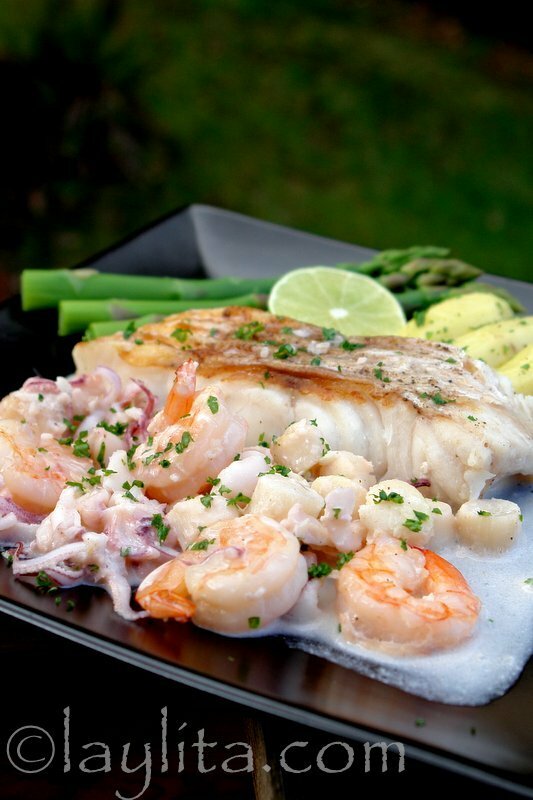 Recipe for grilled fish with seafood sauce, prepared with grilled cod (can also use halibut or tilapia) topped with a creamy garlic seafood sauce made with shrimp, calamari, scallops, garlic, onion, white wine and cream. Season the fish with salt and pepper and heat the grill. Grill the fish right as the sauce is finishing as they should both be served warm. Melt the butter in a large saucepan on medium heat, add the minced garlic and onion, cook for about 2 minutes. Stir in the shrimp and cook for another 2 minutes. Add the white wine and cook for another 2 minutes. 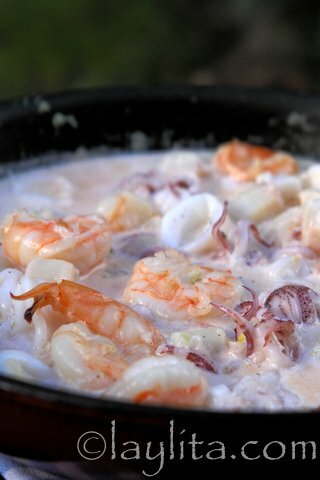 Add the cream and cook until the shrimp are almost done. 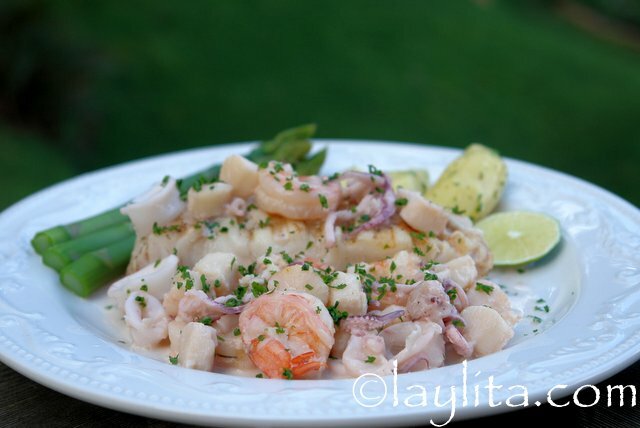 Add the calamari and scallops, cook for 1-2 minutes at the most and remove from heat. Serve the sauce on the side or on top of the grilled fish, sprinkle with chopped parsley. Serve with a slice of lime, fingerling potatoes with parsley, steamed or grilled vegetables, rice, and/or bread to soak up any leftover sauce. 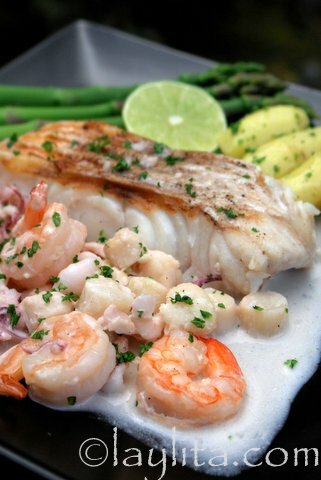 I recommend this grilled fish with seafood sauce recipe for one of those days where you want to make something that tastes great, looks impressive and can be made quickly. I didn’t add any seasoning to the fish besides salt and pepper, I wanted to taste the fish since it was very fresh. Also the seafood sauce is so full of flavor that I didn’t want a flavor fight between the fish and the sauce. I used an indoor grill, a panini press type one, and the fish needed only 3 minutes to be done. I find that this type of electric grill is perfect for fish as it applies heat evenly to both top and bottom and allows the fish to cook nicely without overcooking it. 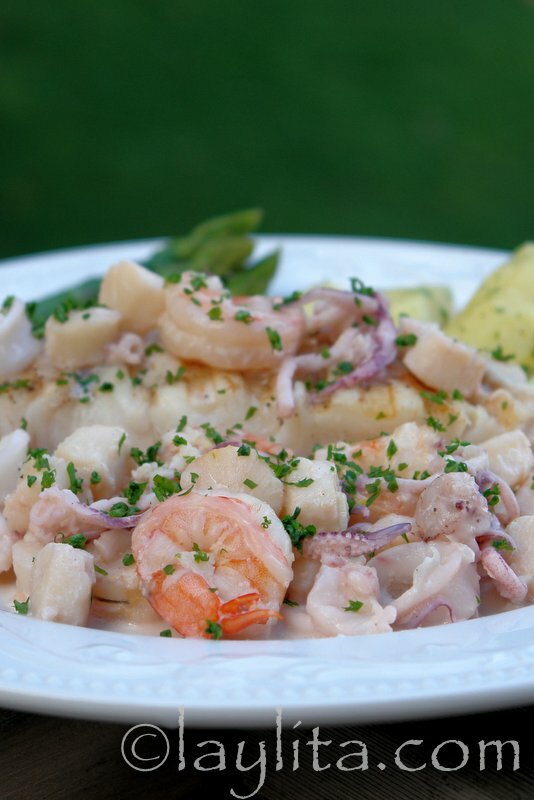 For the seafood sauce I used shrimp, calamari or squid and bay scallops, but you can use any combination of seafood that is available. 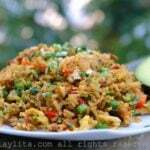 I’ve served this dish with rice and it goes very well, the rice soaks up the seafood sauce nicely. I also likely serving this grilled fish with fingerling potatoes tossed with butter and parsley, some steamed (or grilled) asparagus, and bread (to soak up the sauce). If you’re also grilling veggies at the same as the fish, they also make a great side dish. i like the fingerling potatoes idea. i would probably modify by adding pearl onions but i think this looks really amazing. love the asparagus tips for the color! i want to try this soon. I adore your website! 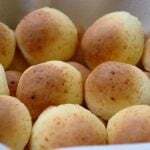 Your pictures and recipes are breathtaking and delicious! Thank you for sharing such beauty with the world! Looks delicious. Am bookmarking this one for future reference.